Neil Curtis, the University's Head of Museums, has created an exhibition which explores the prominent role of the Scots in Fiji's early colonial history. The first British governor Sir Arthur Gordon, his nephew A.J.L. Gordon and the early colonial medical officer William MacGregor were all Aberdeenshire men. All three were influential in the early colonial administration and left collections of significant material to the University of Aberdeen. The exhibition draws on these remarkable collections, including some of the rarest historical Fijian artefact types. 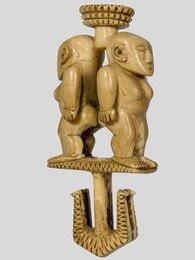 A good example of this is the University's very fine female double deity figure, of which only a handful are known to remain in the world; this one was given to MacGregor by Ro Matanitobua of Namosi in the 1870s, and had been in his family for at least seven generations. The carving's refinement, serenity and symmetry are unequalled. A programme of activities has been organised in association with this exhibition, and the University of Aberdeen's hosting of the 2014 conference of the Museum Ethnographers Group. As part of this programme, project member Andy Mills will be speaking about Fijian art at the Museum on May 10th as part of the city's May Festival. Above: A display case featuring wooden figures, a tanoa and a bilo, showcased in the exhibition. Below: Three world-class Fijian ivory ornaments (top-bottom: wasekaseka, sisi, civavonovono) on display in the Kings Museum, Aberdeen (photo: University of Aberdeen Museums). A rare female double-figure in sperm whale ivory (ABDUA 4651), one of the treasures on display at the University of Aberdeen until 23rd April 2014 (photo: University of Aberdeen Museums). Part of the Fiji focused exhibition at the Kings Museum (photo: University of Aberdeen Museums).